Need extra space in your closet? The Wonder Hanger Max is your answer! This innovative & magical space-saving solution gives you three times the closet space while keeping shirts, pants and blouses neat and wrinkle-free. Each sturdy hanger can hold up to 30 lbs -- that's up to 5 heavy winter coats! Great for the dorm, apartment and seasonal storage. 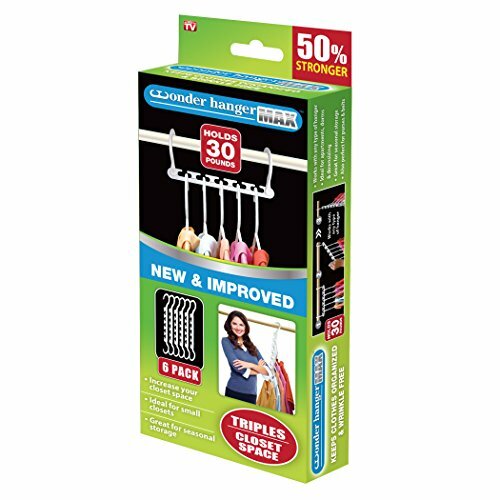 Organizing your closet has never been easier or faster than with the Wonder Hanger Max! This cascading kit includes 6 Wonder Hanger Max, good enough to hold 30 garments. If double up per slot, it holds up to 60 garments! The only question you'll ask is what to do with all that new-found space you've created! Perfect for downsizing, dorms and apartments with limited space. If you have any questions about this product by Wonder Hanger, contact us by completing and submitting the form below. If you are looking for a specif part number, please include it with your message.